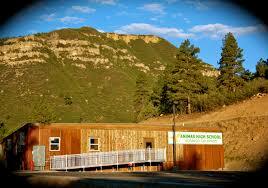 I chose Animas because I had already tried DHS and online school, and neither of them were a good fit for me. I had heard really good things about Animas from friends, and so I decided to come here for sophomore year. I have only been here for one semester, and I already love it. I think that I am a hands on learner, and Animas has been great for that. I love the project based learning aspect of AHS because it is easier for me to learn through projects, than lectures. I also really like the culture here at Animas, everyone is kind, and much closer than at DHS. This extends to student teacher relationships. I feel much more comfortable with my teachers here at AHS, than I have anywhere else. I am very introverted, and bad at public speaking, which is a big part of Animas, so I am getting better at that. Overall, Animas is a great fit for me, and I am very glad that I transferred.